Avian Studios, LLC was founded by Dr M. Scott Echols (left), a board certified avian veterinary specialist to create educational media that help people improve and enrich the lives of captive birds. Scott lives with his wife Layle (also a veterinarian), daughter Alaina and lots of animals and practices in multiple locations in the United States. His diverse interests include bird medicine and surgery, art, making educational movies, playing guitar, outdoor activities, nutrition and building sustainable positive benefit business. 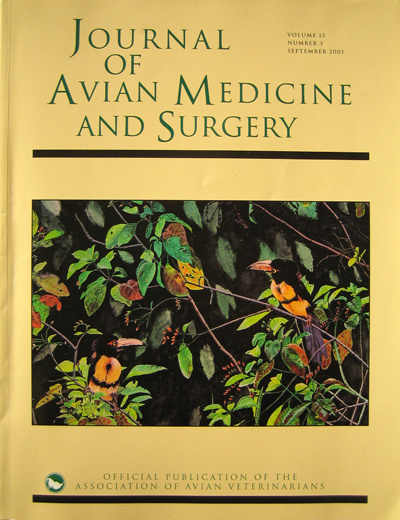 Dr Echols received the 2005 Ted Lafeber International Avian Practitioner of the Year award, the 2007 Texas Non-Traditional Species Veterinarian of the Year award, two 2017 Wellcome Images awards, the 2018 Distinguished Texas A&M Alumnus Award and he has had two original watercolor paintings (‘Two Collared Aracaris’ (pictured right) and ‘Archaeopteryx’) appear on the cover of the international Journal of Avian Medicine and Surgery. In 2017, Dr Echols was featured on NPR’s Science Friday in both video and audio formats and The Atlantic’s Quartz online publication. Scott is an Adjunct Professor at Texas A&M College of Veterinary Medicine, a past President for the Association for Avian Veterinarians, a frequent lecturer at multiple universities and conferences in the US and abroad, as well as author and filmmaker. 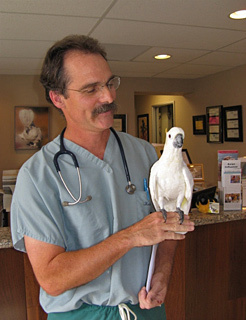 After completing a bird medicine and surgery residency with Dr Brian Speer (left) at the Medical Center for Birds in Oakley, California, Scott became the Director of Avian Medical and Surgical Services at Westgate Pet and Bird Hospital. Now Dr Echols lives with his family in Utah and works worldwide. It was at this time that he added film to his efforts. Since then his film work has been centered on providing teaching videos to other veterinarians and bird owners. 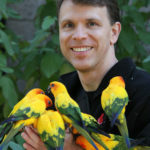 His focus on teaching foraging techniques to improve the lives of pet birds along with his short movie ‘Captive Foraging’ have gained him international attention. Most recently, Scott and his mentor Brian Speer have developed a consultation and surgery business that provides veterinary bird care services throughout North America. Dr Echols is the director of the Grey Parrot Anatomy Project and also founded Scarlet Imaging which develops revolutionary contrast agents.